Yes, someone out there thinks that turning 16-bit classic Zombies Ate My Neighbors into a big screen zom-com might be a great idea. If this sounds like a scary proposition to you, this project still has a long way to go. According to a report from First Showing, LucasArts' 1993 zombie classic is being prepped for a Hollywood production, described as "John Hughes meets Judd Apatow meets George A. Romero" or "a bit like Superbad + Zombieland + Home Alone." 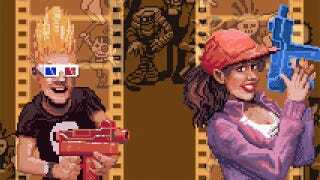 It doesn't seem like this Zombies Ate My Neighbors project has the blessing of LucasArts yet, as First Showing reports the writer and producers are still seeking rights and funding. Still, high school coming of age comedy with some goofy zombie slaying? I might be able to get behind that.